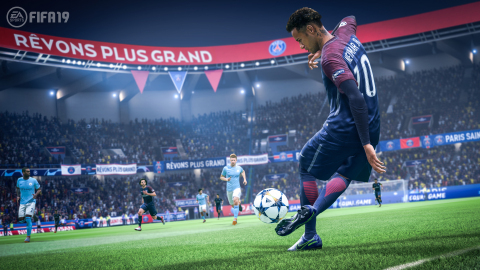 REDWOOD CITY, Calif.--(BUSINESS WIRE)--Playing across consoles, PC, mobile and competitive experiences, from all corners of the globe, players are making EA SPORTSTM FIFA the world's favorite sports game. Since EA SPORTS™ FIFA 18 launched 11 months ago, players from all over the world have been playing the game more than ever before in franchise history. FIFA Ultimate Team™ (“FUT”) continues to be one of the most popular modes in FIFA, and FUT 18 fans have created over 13 million clubs within the mode. Developed by EA Vancouver and EA Romania, FIFA 19 will be available worldwide September 28th on PlayStation®4, Xbox One, Origin for PC, and Nintendo Switch™ systems. Players that pre-order FIFA 19 Champions or Ultimate editions on PlayStation®4, Xbox One, Origin for PC will get access three days early on September 25th**, while Origin Access Premier members on PC will be able to play the full game on September 20th. Origin Access Basic members on PC and EA Access members on Xbox One will also be able to jump into the Play First Trial on September 20th***. *NOT ALL FEATURES OR LEAGUES AVAILABLE ON ALL PLATFORMS. FROSTBITE GAME ENGINE AND THE JOURNEY: CHAMPIONS ARE AVAILABLE ON XBOX ONE, PLAYSTATION 4 AND PC PLATFORM VERSIONS ONLY. UEFA CHAMPIONS LEAGUE CONTENT AVAILABLE ON XBOX ONE, PLAYSTATION 4, PC AND NINTENDO SWITCH VERSIONS ONLY. THE JOURNEY: CHAMPIONS, UEFA CHAMPIONS, CHINESE SUPER LEAGUE AND ALL NEW INNOVATIONS ARE NOT AVAILABLE ON FIFA 19 LEGACY EDITION ON PLAYSTATION 3 AND XBOX 360. SEE HERE https://www.easports.com/fifa/champions-league-features FOR MORE DETAILS. **CONDITIONS AND RESTRICTIONS APPLY. SEE https://www.easports.com/fifa/fifa-19-game-and-offer-disclaimers FOR DETAILS ON CHAMPIONS AND ULTIMATE EDITIONS. *** CONDITIONS AND RESTRICTIONS APPLY. CERTAIN TITLES MAY NOT BE INCLUDED. SEE ea.com/ea-access/terms AND https://www.origin.com/store/origin-access/terms FOR DETAILS.